Thanks in no small part to Thunderbolt 3 and USB-C, hardware companies are making a serious effort to roll out external graphics card (eGPU) docks for laptops. An eGPU can turn a regular laptop that has a strong processor, but a weak integrated GPU into a powerful gaming rig capable of running AAA titles. After making a splash at CES, companies used the recent Computex 2016 show in Taipei to show off new eGPU wares. 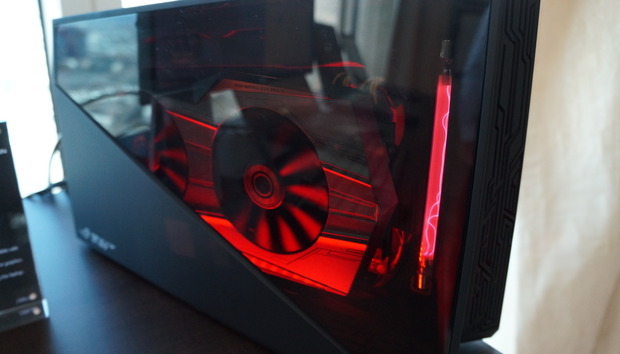 The newest entrant was Gigabyte, which showed off a modern eGPU dock that was still in early development, as first reported by Tom’s Hardware. Details are still scant, but the good news is Gigabyte—at least so far—is opting for a Thunderbolt 3 connection over USB Type-C instead of a proprietary connection. On the downside, the eGPU dock is sporting a 250-watt power supply, which puts it well under competitors like the 500W PowerColor Devil Box. Less power for the dock means less power for the graphics card and could limit what the box can support. Gigabyte is apparently considering bumping the PSU to 350W, which should make it easier to run higher-end cards. Gigabyte’s box also stands up vertically, instead of sitting horizontally on the desk, which is outside the norm. There’s no pricing or release date yet for Gigabyte’s eGPU dock. Asus brought the ROG XG Station 2 dock that first appeared during CES in January. Little has changed about the actual device, but Tom’s Hardware says it will roll out later in 2016. Why this matters: Thanks to the hearty bandwidth that Thunderbolt 3 offers and its compatibility with USB Type-C, eGPUs are becoming a more viable prospect. Prior to the latest round of eGPU madness, laptop gamers either had to get a desktop-replacement laptop or opt for a DIY eGPU solution. Early adopters could also purchase a laptop that worked with one of the sporadically released pre-Thunderbolt 3 eGPU docks rocking a proprietary connection (the XG Station 2 will offer a proprietary connection as an option). Now, however, we are arriving at the moment where plug-and-play solutions are opening to laptop owners that wants to play but lack the built-in graphics card to do it.